In a live environment, our channel receives data from a source program/system, then sends processed data back out to the client’s destination system. 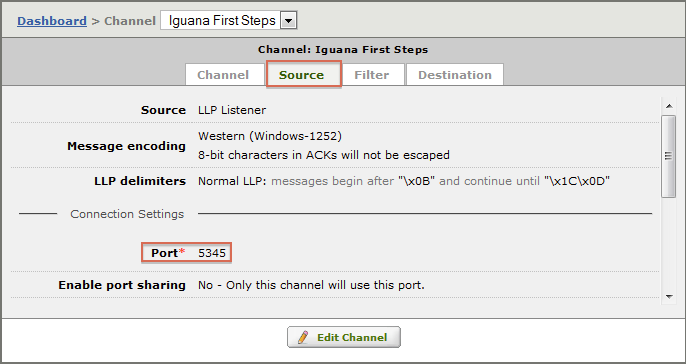 For the purposes of this tutorial, we are going to simulate this workflow using the HL7 Simulator and HL7 Listener tools that are included with Iguana (Windows version only). If you are working on another platform, please contact us for tips on how to perform a similar simulation. If you haven’t already, open the Dashboard. Take note of the Port number (in this example, port 5145). The channel uses this port to transmit processed HL7 messages. From the Start menu, select All Programs > iNTERFACEWARE > HL7 Analytical Tools and open the HL7 Simulator. From the Start menu, select All Programs > iNTERFACEWARE > HL7 Analytical Tools and open the HL7 Listener. Now that we have set up the environment, we are ready to run the ‘First Steps’ channel.